You go girl! You can't let a stupid shawl get the best of you. Besides, it's going to be so much fun when you get to the lace! You´ve been busy again! I love especially those socks! I haven´t made just anything at home, but at school we´ve painted stone chickens and decorated willow twigs. Today there we make Easter bunnies and witches. Of course we sew more bags there too. You had me laughing with your paragraph about the shawl. You can do it -- just take your time! I cannot wait to see the lavender quilt! Those socks are gorgeous, but $100 a skein, that's outrageous!!! You couldn't possibly walk on them if you paid that much could you?? I think you made a good trade - much prettier than a pan :o). I'm looking forward to seeing your lavender quilt - I went mad on lavender and green not so long ago, such a pretty combination :o). P.S ... Good luck with the shawl!!! Talk to the garden fairies all you want; they're very nice, and even talk back occasionally, when they think you deserve it. coincidence -- I'm about 5 inches into a pair of basketweave socks right now -- I think I've gotten to the point where I actually remember the pattern sequence without having to keep looking at the book! great book! Darling hats! Don't you just love hats? They are so quick and easy to make. That sock is incredible! I just love the heel. I'm definitely going to check out that book. I'm almost finished with my first "real" sock, so I'm ready to knit some more. 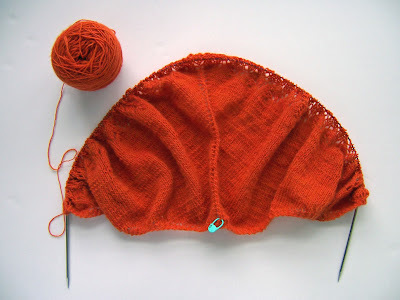 Your shawl is beautiful so far. I'm looking forward to seeing it finished, and seeing your new quilt. Love, love, love the socks! 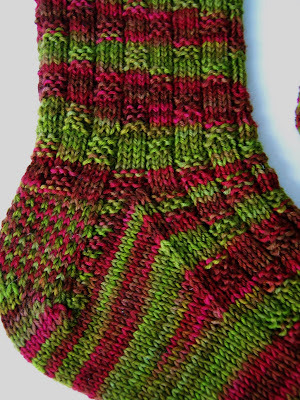 And the heel with that yarn. Amazing the difference from the blah picture in the book (my favorite!). Good luck with the shawl. I really like your socks. 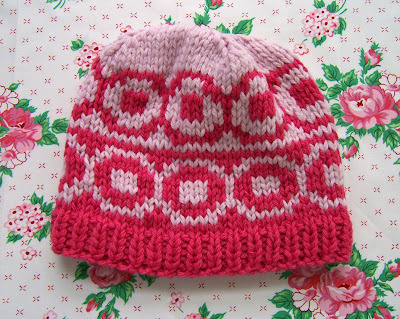 Great pattern and pretty yarn. I must not be a great yarn efficianado because I have never heard of that yarn, but I agree much nicer than a pan. Does it feel as nice as it looks? But you got Wollmeise! It's the unicorn of yarn! I myself am not a hundred dollar a skein person, or stalking their site but I hae read of this mythical yarn and think it's pretty amazing you got some. I'm envious of your knitting abilities. Some friends tried to teach me how to knit and it was bad. My shoulders were up under my earlobes and I cursed a lot. With that said, though, I still agree that wool is better than a pan. That skull hat is cool. You are amazingly talented. I love the hat and socks! And yes, netflix is great. I just signed up a few weeks ago and love it!!! WOW...what a 'knitty' person you are...*LOL*...it seems odd a person living where you live knitting hats and socks....but, I know who you are doing them for!! Lisa, I love the road trips on your blog, but I also really love when you show us pictures of your knitting! Especially socks! 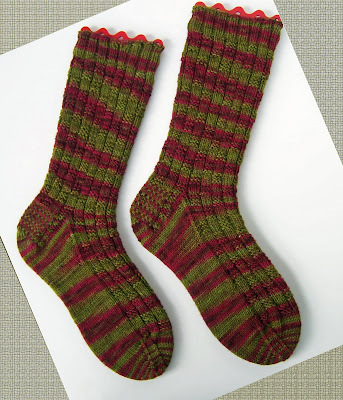 I've been following your socks for several years now---and you've made me want to take up knitting socks! Coddingtown (you remember that shopping center, right) Well, Village sewing has the most wonderful yard shop inside their sewing machine store there now---I'm really tempted to see if one of the classes they offer is knitting socks! I love the hats and socks you just finished! Can't wait to see the shawl...pretty color. Hang in there! Those are all very cute, but I'm stickin' with flat stuff. The socks are adorable, though. (When do you wear wool socks in Hawaii?) And, does hundred dollar a skein yarn knit any better than the regular stuff? 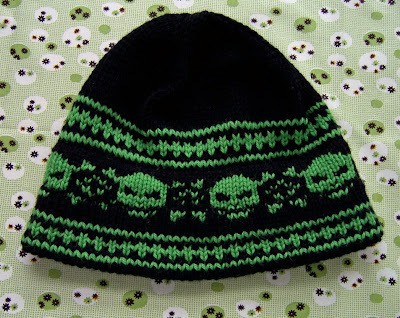 I take my hat off to anyone who can knit anything out of any yarn. My brain hurts thinking about basketweave rib. I'm definately loving that skull hat!!! Makes me wish I could knit. Wow...all the knitting is so pretty! Hey there....the yarn is $100 on Ebay...but it actually cost me a little over $25.00 and 6 months of stalking the website. Lisa says it's a pan...but it's an expensive pan..which I use almost daily!!! I think it's now my favorite piece of cookware...and somehow...my food really does tastes good these days!!! These are lovely. I cannot make them, but I always buy them, which is fulfilling too. Man I wish I could knit. I just cant get it. I tried and it's not for me but I love your things you've kitted Missy.